A seven-year-old boy is being treated in hospital after being bitten by an adder at a Lincolnshire beauty spot. Jack Middleton, from Billinghay near Sleaford, had been on a family visit to Ostlers Plantation in Woodhall Spa. His mother, Sophie, said her son's hand was black and swollen after being bitten by the snake. Adders are one of the most widespread species of snake but Britain's only venomous reptile. Incidents of humans being bitten are unusual. 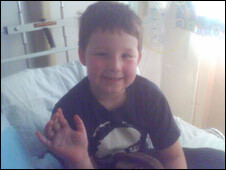 Jack remains in Lincoln County Hospital for observation. His grandfather Harry Middleton said the snake hissed and spat after one of Jack's younger cousins picked it up, then bit Jack as she dropped it.